Centuries ago Plymouth was a seaport mainly centred along Sutton harbour. The city, as we now know it, didn’t exist. It was mostly rolling hills, dales and vales with a spattering of cottages and a few small villages set amid the arable fields of manor estates and lush farmland pastures. Some of the villages had parish churches with towers and spires stretching into the skies above the countryside – idyllic picture postcard scenes, which on the whole are now sandwiched in the midst of twentieth century housing estates. The site that would become Hartley Pleasure Grounds and Reservoir, which is now in the heart of a densely built up part of the city, was in Victorian days a considerable distance away from the outskirts of town. But the population of Sutton had grown rapidly from the middle ages, and the need for housing would soon push out the town’s boundaries, reflecting in new developments. The foot of Townsend Hill (a corruption of Tongue’s Land) opposite the Hyde Park Hotel ironically once marked the original Town’s end and was around that time part of Compton Giffard. The nearest development was the splendid high-class, semi detached and detached houses in Mannamead each set in its own spacious gardens. The Mannamead Road section of the main Tavistock Road outside the reservoir leads southwards to what we now know as Mutley Plain. At the time of Domesday it was recorded as ‘Modlei’ and in 1500 there is mention of ‘Motley Park Lane’ (the present Weston Park Road) The northern manor part of Mutley was later split three ways – part in Peverell, part in Mannamead and part in Hartley. The modern Mutley consists of the southern manor of Modlei plus lands to the east - originally part of Lipson and Compton. The name ‘Mutley Plain’ probably dates back to George III when the Mutley section of the road was raised and levelled from the original ‘ups and downs’. In 1850 there were a few houses set back from the road in Ford Park – some still survive behind the shops near the Swarthmore Centre, Mutley. Detached villas were soon built off Ford Park Road and are now owned by Plymouth College - established in 1880. Around 1868 the main housing developments west of Mutley Plain took place. Victorian buildings, Mutley station (1849-1939) and the Methodist Church (1881-1979) were built on Mutley Plain and tramlines installed. The early twentieth century saw parts of manor estates, like the Seymour estate, auctioned and houses began to sprout up like mushrooms, particularly in parts of Compton Giffard, Western Peverell and Middle Mutley. The new inhabitants would benefit from the reservoir and pleasure grounds laid out forty years previously. Throughout all this, the Drake and Stonehouse leats meandered – sweeping through farms, villages and new developments - an important source of power for the many mills that depended on them, particularly in times of drought and falling water levels of natural streams. Nowadays it is hard to imagine that Tavistock Road, leading out of Plymouth by the North Hill route hence onto Roborough was originally determined by the course of the streams and rivers it had to avoid. With Hartley the site of a very important distribution reservoir, the water situation is very much paramount to its history and that of the pleasure ground. But to understand the water situation we must go back to 1254, when Plymouth first became a town and wells and streams provided ample water. Most of Plymouth (including the Tor estate area of Hartley) was and still is riddled with underground springs and streams. The Stonehouse Creek was tidal as far as Penny-come-quick and three rivers running from Tor/Venn, Oxford Avenue and Houndiscombe Valley flowed into it. To the west the tidal waters reached Lipson beyond Trefussis Park and two streams flowed down to it – one roughly following the course of Alexandra Road and the other running a little below Compton. The river situation was similar north of Mutley and greatly influenced the route of the main road from Sutton to Roborough, and the east west road from Plympton to Saltash Passage. These roads cross between Hartley Reservoir and Sungates. But before work could begin a Plymouth Water Bill needed to be heard in parliament. The Act was passed with Royal Assent on 29th March 1585 with Sir Francis Drake, then MP for Bossiney in Cornwall, among the men who ensured it through the committee stage. The Plymouth Leat dates back to 1590, when after the war with Spain, Sir Francis Drake - the ex Lord Mayor of Plymouth - was appointed to oversee and engineer the work. There has been controversy over Drake’s precise contribution to the leat, but it is said that he took a paramount role in much of the covenants or purchases of the land through which the leat would course. Few would dispute the legend of him riding on a white horse ahead of the first flow of water – a legend almost certainly founded on fact. The leat was completed on April 23rd 1591. Conduits were erected to enable inhabitants to draw water without charge. By the 19th century, the leat would play an important role in the distribution of water to various reservoirs for the fast growing population of Plymouth. The Plymouth Local Authority built the Drake’s Place Reservoir at North Hill in two separate parts in 1825 and 1828, as stated on the tablet on the wall. Another tablet shows that in 1891 the two reservoirs at Drake’s Place were deepened and made into one. Ornamental fountains were installed. In the wall above the now disused conduit, which was rebuilt in 1671 is the inscription ‘Made in the Maioraltie of John Trelawnye 1598’. Above this are the Arms of Drake and crests. The reservoir is no longer used for water supplies, but principally retained as a picturesque tourist attraction and for university studies. It is said that the reservoir contains terrapins - pets released by their owners when they outgrew their welcome. There are also ducks and waterfowl. Under threat when the controversial northern relief road was destined to sweep through the park in the 1970’s it escaped when the route was altered and is probably the only local uncapped reservoir. The Old Crownhill Reservoir (Knackersnowle) was built in 1851 near the course of the Plymouth leat. ‘The catchment basin of the River Meavy is 4,000 acres - 6 square miles. Altitudes above sea level vary from 700 feet at the weir of the Meavy to 1,300 feet at the summit near Princetown. This basin is drained into the Meavy by three tributaries – the Deancombe, Wineford and Stanlake and their subsidiary feeders. 16 years observations showed 56 inches average annual rainfall, whilst Plymouth only had 35 inches’. Construction of the Hartley Reservoir took from 1859-1862, some ten years after the service reservoir at Crownhill. It holds nearly 7 million gallons (around 30.4 million litres) and was designed to receive water from the leat. It appears that the authorities purchased the land to the north of the grounds of Hartley Villas and south of Higher Compton Lane (now Road) with the sole aim of creating a distribution reservoir. It is said that in those far off wondrous days there were fights over water rights and obstructions interfering with the flow of the leat - and that outbreaks of cholera brought much of these feuds to an abrupt end. The two Barn Park Reservoirs holding 6½ million gallons (around 29.5 million litres), were built in 1860 to help supply Stonehouse through a piped system installed in 1833, but because of the lowness of the situation they were found to be inadequate. From 1867 these reservoirs were boosted by piped water from Hartley Reservoir (600,000 gallons a week paid for by Stonehouse) After 1882, they were only used during World War I for emergency supplies, and for fire fighting during World War II. During the post war years they were, for the most part, empty – a dangerous ‘playing ground’ for children who were attracted by the frogs and newts that bred in abundance in the shallow puddles in the cracks of the dilapidated slimy basin. The reservoirs were later filled in and incorporated into Central Park as football/sports’ pitches. In 1864 engineer Thomas Hawksley recommended improvements to the water supply including protection of the open channel from Widey Mills to the tank at Hartley Reservoir. Plymouth Corporation Water and Markets Act received Royal Assent on 15th July 1867. The Act provided for water to be piped into domestic and other accommodations in return for a yearly rates’ charge and enabled the corporation to make general improvements. In 1867 the engineer Robert Hodge recommended a pipe to carry leat water from Manadon Hatch to Plymouth, to discharge into the leat at Mutley or direct into Drake’s Place Reservoir. In the 1870’s the leat was deepened and repaved and many sections were covered-over. A Service Reservoir was constructed to regulate supply and provide sufficient pressure for the expanding supply/pipe network. In 1881 snow on Sheepstor caused the most severe water shortage ever experienced in Plymouth. Records of 29th January show that there was no water in the leat or the reservoirs at Crownhill and Hartley. There was only three inches in the Drake’s reservoir, which was reserved for fire. There had been no domestic supply for the previous three days. In 1885 Roborough Reservoir was built. 24-inch diameter cast iron pipes were laid, replacing a section of the leat between Roborough service reservoir and Crownhill. Problems with the supply caused through freezing winter temperatures and droughts in summer lead the corporation to consider improvements to the methods of supplying the city’s needs. In 1891 the leat at Roborough Down was covered by fifteen inches of snow, cutting off Plymouth’s water supply for a week. On Monday 9th March a snowstorm raged throughout the night. Hartley Reservoir contained only two days supply and was the only source of drinking water. Between Wednesday and Friday, civilians, armed forces’ personnel and gangs of workmen battled to clear the ten mile blocked section. They engaged the use of a cross-country pipe to convey water to Roborough. It was Sunday before the normal supply was regained. Between 1893–1898 Burrator reservoir was constructed on Dartmoor and new pipe work connecting Roborough Reservoir was undertaken/completed. Burrator’s capacity was 668 million gallons – this increased to around 1,026 million gallons (around 4,210 million litres) in 1928. Its top water level is 218.9 metres above the ordinance datum point at Newlyn, Cornwall. From 1593 Stonehouse had been supplied by the leat from a stream at Torr, from 1867 the inadequate reservoirs at Barn Park were topped up by Hartley. From 1893 Stonehouse was supplied by Plymouth. In 1914 the boroughs of Plymouth Devonport and Stonehouse amalgamated and various supplies were merged into a single provider. Parts of the leat were still uncovered in the late 19th and the early 20th century, including the west side of Mutley in 1890. Severe frosts in January and February 1917 resulted in ice ten inches thick at Burrator dam. Both leats were blocked with ice and water was conveyed from the Meavy through a leat to Dousland. It is clear from Plymouth Water Works engineers’ reports, snow and ice caused frequent problems with the leats, so it is little wonder that parts were covered or replaced with pipes over the years. It is also clear that burst pipes and people leaving their taps running overnight to avoid burst pipes worsened the winter problems. It would appear that water shortages are for the most part behind us since the construction of the Roadford Reservoir in the late 20th century. Hartley Reservoir was built very much on open land with Hill Lane running due north, down past a nursery on the east to a farm in the valley. Beyond the fork of Higher Venn and Old Tavistock Road was the old house and farm at Tor. Further down the old road into Plymouth there was Mount View – now Plymouth College Preparatory School, and Thornhill House with its extensive gardens. It would appear from an 1842 tythe map that the fields numbered 151 and 152, which were known as Broad Park and Cross Park was the site chosen for the reservoir. These meadows were owned by Philip William Dayton and occupied by Ambrose Matticott. The boundaries were marked out with Tavistock Road, (Mannamead Road) Higher Compton Lane, (now Road) an unnamed lane, (now Reservoir Road) and the grounds of Hartley Villa, (now mostly the rear of the cul-de-sac known as Hartley Park Gardens). The reservoir sidewalls to be flat-bedded limestone, well flushed in with hydraulic line mortar. The exterior walls at the reservoir shall be neatly dressed and the joints pointed, the masonry built in courses two feet in height and well grouted. The bottom of the reservoir shall be formed of six inches of concrete to make an even surface. On top of the concrete there shall be a layer of puddle at least 12 inches deep and on top of the puddle shall be one course of best Jersey brick. Puddle: the puddle is to be composed of good brick earth or potters’ clay, free from stones dirt and rubbish of any kind, and is to be tempered and wrought to a proper consistency for brickmaking, and then to be deposited over the concrete in the bottom 12 inches deep in courses of six feet wide and worked down by chopping and treading so that a perfectly watertight lining may be formed - when finished 12 inch thickness. Walls: boundary walls with two gate entrances 9 feet wide and two side doors 3 feet 6 inches wide shall be built adjoining the Tavistock Road, and the road leading to Compton. The wall on the Tavistock Road shall be 24 inches at the foundations and 21 inches at the top, finished with forest copings. The contractor shall build a nibble masonry wall on the south side of the Compton Road the whole length of the field. The walls at foundations 4 feet thick and reduced to 2 feet at the top and to the height as shown on the section and finished with forest coping. 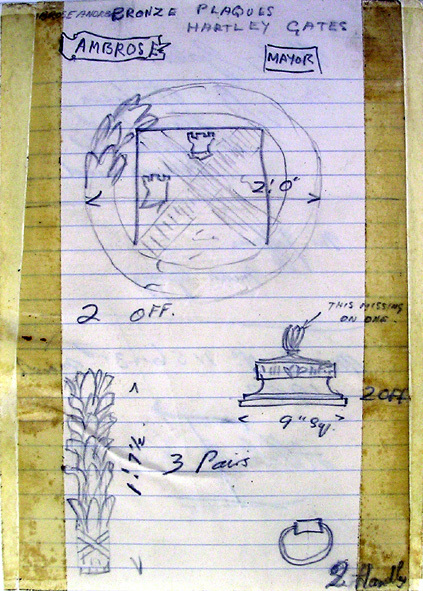 The gate entrance shall be formed with large limestone rough picked with chisel draft 1½ inches, to be 2 feet square, 10 feet high and coped with one stone 15 inches high, projecting 2 inches on all sides and dressed on top as shown on plan. The contractor shall build a hedge on the eastern side of the reservoir 6 feet wide at the bottom and 3 feet wide at the top and 6 feet in height faced on both sides with stone. The contractor shall build a cottage 34 feet by 15 feet, sidewalls 12 feet high with two gables and two partitions. One room shall be for the use of the engineer and the other for the use of the contractor while the work is in progress. The doors and windows to have brick reveals and the chimney tops raised 3 feet above the roof in brickwork. It is assumed that this cottage is the property on the right as you enter by Mannamead Road and later used by the caretaker, but the specifications’ original plan for the construction is not available, so it is unclear. It is also assumed that the specifications refers to one double entrance at the junction/corner, (now used by the substation) as plans to build an entrance in Higher Compton Road were still under consideration as late as the 20th century and there were originally steps leading to a small doorway in Mannamead Road. It is unclear when the Higher Compton Road entrance with the kissing gate was made. In the 1890’s railings were installed around part of the reservoir’s perimeter and in 1932 a new intake well was completed, new valves were fitted in the outlet tunnel and the screening chamber was extended. These screens (and the leats) required regular cleaning. The reservoir covers 1.339 acres, has steeply inclined sides, holds nearly 7 million gallons (30.4 million litres) has a depth of 5 metres (around 17 feet) and serves around 15,000 properties – 78,000 citizens. Its top water level is 96.6 metres above the ordinance datum point at Newlyn, Cornwall. Records show that the duration of retention (how long it would take to empty out completely) for the summer months is 163¼ hours, and in winter 151½ hours. Distribution is still largely by gravitation, having firstly been purified at the Crownhill waterworks. Pumps can be employed if deemed necessary, but this can result in the water appearing whitish due to the pure air content. This harmless aeration can also occur with the testing of water hydrants used by the fire brigade. 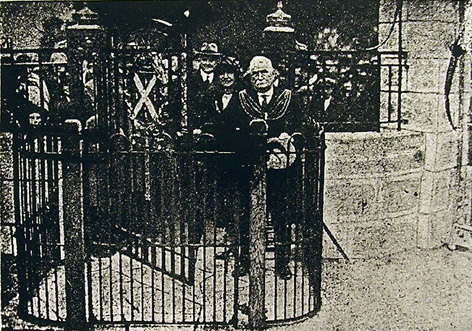 In November 1929, the Mayor and Mayoress of Plymouth, Mr and Mrs Ambrose Andrews presented the city with the wrought iron and bronze main entrance gates as a memorial to their term of office. The city engineer and architect designed the gates, which were cast by a local firm, in a style that was distinctly original. The mayor formally opened the gates at the Mannamead Road entrance with a special key in a public ceremony accompanied by his wife and in the presence of officials and members of the council. Ambrose Andrews was also responsible for extending the pavement from Inceworth to the reservoir entrance, but the suggestion of another entrance in the wall at the Carhullen end (Higher Compton Road) of the reservoir grounds was thrown out. The Hartley Grounds were described as being one of the lungs of Plymouth, claiming views as fine as any that could be obtained. 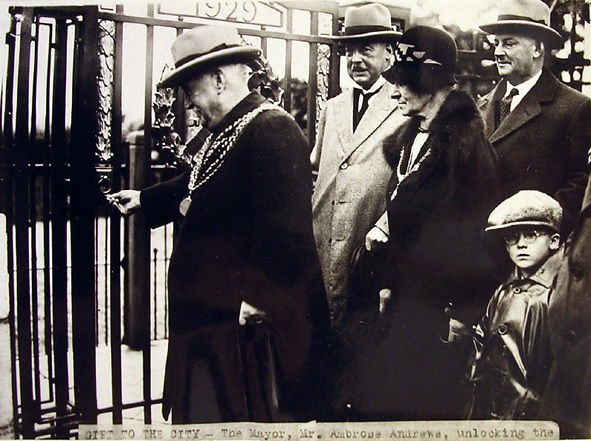 The pillars of the magnificent gates were surmounted by bronze and in the centre set in an enormous wreath of laurels, the Plymouth Arms and below in raised lettering ‘Ambrose Andrews, Mayor’ The top of the gates carried the figures 1929. The gates remained in place until their removal during World War II along with other gates and railings destined for the melting pot for use as weapons of war. Wrought iron could be used but cast iron was useless. What remained was eventually bulldozed into pits at the tip in Lipson Vale or at Shapter’s Field in Cattedown. In February 1942 Alderman Stephens, a former mayor, asked that the gates be reinstated, but Alderman Dunstan announced to the council that they had already been broken up. However, as late as 1950 it was said that the gates were not used and were still at the Engineer’s Prince Rock depot. If this were the case then it would have been appropriate for these fine memorial gates to have been restored and returned to their rightful place. It can only be assumed that they were trashed or used. Before it was covered the reservoir was a picture of great beauty and used at times for such activities as racing/ floating remote controlled speedboats. This beauty however was masking a problem lurking in its depths – trash consisting of old rusty bicycle frames and prams, wrecks of model boats, drinking cans, oil cans, milk bottles, road signs and an array of rubbish engulfed in several inches of gooey slime, which covered the reservoir’s base. Even a motor vehicle crashed through and ended up in the water. The discarded rubbish was discovered in a cleaning out operation conducted in January 1976, during major work to concrete over the stonework and eliminate possible leaks. But as long ago as 1945 Mr Norman Elliott, the city water engineer, had unsuccessfully recommended capping to prevent the water becoming the breeding ground for insects and algae. He argued that it was a waste of time and money treating water at Crownhill and storing it at Hartley where it would become subjected to pollution and need treatment again. Prior to this in 1932 the reservoir had needed to be emptied and cleared of six inches of mud on the bottom. The estimated cost in 1945 to cap the reservoir was £12,000, in 1972 the council rejected it yet again at a cost of £76,000 – but in 1982 the original cost had soared over sixty-fold to an estimated £763,000. In 1974 with the creation of regional water authorities, the scheme was taken over by the South West Water Authorities. Their Manual for British Water Supply Practice stated that service reservoirs should be totally enclosed with concrete roofs - Hartley was one of the last reservoirs in the country not to be covered and would need to be in order to conform with Water Acts. Chlorination at Crownhill treatment works was 0.3 parts per million – Hartley needed an additional 0.2 parts per million to retain its purity. Regular bacterial examinations of the water have been carried out for decades. In spite of objections from local residents and conservationists, work to drain the reservoir began around February 1981 and the capping was completed in March 1982. A concrete roof was installed and grassed over for the use of outdoor leisure pursuits. Access manholes for maintenance were provided – the only visible sign that such a vast underground water storage tank exists. But before allowing the flow of seven million gallons to refill the reservoir, the authorities inspected the huge underground chamber, which has 165 concrete pillars supporting the roof. It cost £587,000 to roof over the distribution tank in order to prevent contamination to the treated water supply that served around 78,000 citizens in the early 1980’s. So a level grassy area replaced the view of the gleaming water and the shimmering fountains and falls. The only visible evidence of the reservoir is the manhole covers used for maintenance access. Outside the perimeter railings, a disused drinking pump is reminiscent of long ago days. With Hartley Park covering some 6.098 acres, it was the authorities aim from the start that a pleasure ground should be laid out adjacent to the reservoir for the local people’s enjoyment. This continued on the new area of grass with the reservoir’s covering being utilised for croquet. Inside the perimeter railings are four full-sized croquet lawns, wooden club huts and a SWEB substation. Buildings in the pleasure grounds include a dilapidated shelter, and toilets. Nearby are tennis and basketball courts, surrounded by high protective fences and floodlights, and a children’s playground that is surrounded by railings. The remainder of the grounds is laid out in grass, trees and paths. Furnishings include park benches, litter and dog poop bins. There is barbed wire along part of the inside of the Mannamead Road wall. A high wall runs from the junction of Mannamead Road and Higher Compton Road to the kissing gate entrance where it continues on a much lower level as stonewall hedging. The kissing gate is metal, as is the full size gate alongside it. There are three other entrances – the main entrance in Mannamead Road, the corner of the junction between Mannamead Road and Higher Compton Road - used by the electricity substation, and at Reservoir Road. From here steep steps lead to the raised area of grass where most of the excavations were deposited – a wonderful vantage point for some of the most magnificent views of Plymouth and the surrounding countryside. Wildlife in Hartley Park includes an abundance of rabbits, songbirds, squirrels and some pigeons. There is also at least one pair of owls, which may help to control the numbers of rabbits in a natural way. The council keep the population of rats under control with poison. There was once a sweet shop to the right of the path at the Mannamead Road entrance – a converted greenhouse with sweet-jars on the shelves. The caretaker’s house was also on the right, and the caretaker in 1915 was taken ill and admitted to Didworthy Hospital. General Accident Assurance occupied the second house in 1950. The whole property was sold in the 1970’s and at some stage was converted into one house. Among the occupiers of the 1970’s were a family who bred Cairn Terriers – as local residents and dog walkers from that time may recall. The house has recently been sold and refurbished, the chimneystacks removed and a garden area fenced off. There is also a garage and car parking space for the use of the property. In the early days sheep grazed the upper parts of the park – a farmer Mr H.H. Endicott paying twelve guineas a year around 1914. Mr Endicott later offered the authority £20 a year. Other letters to the authorities include one concerning the trees from Mr E. Carcombe, another in October 1927 concerning the toilet seats from Mr F.S. Blight and an application from Miss Dallas in 1924 to rent a piece of the grounds next to the tennis courts for two afternoons a week. Many varied repairs over the years, such as those to the park benches in 1938, are recorded in the Plymouth Corporation Water Works engineers’ reports. North of the reservoir and south of Sungates, set into the wall on the eastern side of the main road, are two boundary stones (Tything of Weston Peverell and Tything of Compton Giffard) set either side of the top of a medieval cross, which marks the spot where the Iron Age road (Tavistock Road) from Sutton Pool to Roborough Down crossed a trackway from Plympton to Saltash. Tythings date back to Anglo Saxon times, originally a collection of ten households where each was responsible for the behaviour of the rest. Ten Tythings made up a hundred and Westone (now Pennycross) was part of the hundred of Roborough. Both the manors of Western Peverell and Compton Giffard appear in the Domesday survey when Judhel of Totnes acquired them from their Saxon owners. Plymouth:As Time Draws On - Volume 2, by Chris Robinson. Plymouth a New History – 1603 to the present, by Crispin Gill. Portrait of Plymouth, by J.C. Trewin. Report of Plymouth’s water supply, by A.H. Bampton. Plymouth Corporation Waterworks: Engineers’ reports. Plymouth City Engineers Specification workbook 1849-1974. City of Plymouth: Water Supply of Plymouth 1590-1591. Water From the Moor by David J Hawkinge. Plymouth Water Supply by W L Copley and T H Gaut. South West Water, Exeter and Plymouth offices. The author would like to thank any persons or establishments who assisted with information. The text is reliant on the accuracy of this and any other information gleaned from the above research sources. ©2003 Vina Shaddick: (Friends of Hartley Park). Pages maintained by The Friends of Hartley Park. Hosted By Four Degrees West.